Last Friday Urban Melbourne was on hand to view the last concrete pour for what has rapidly become one of Melbourne's more pronounced skyscrapers. 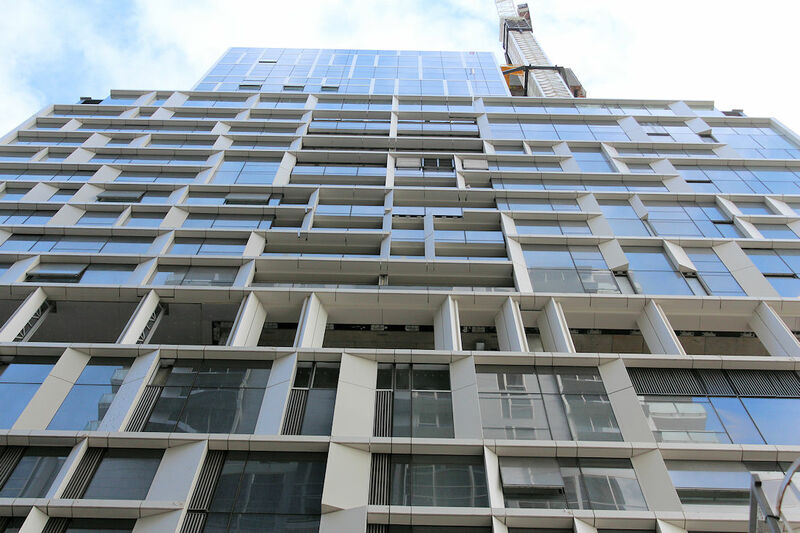 With the final floor of 35 Spring Street's 43 levels now in place, the process of fitting out the luxury residences within will continue at pace, with an eye toward a 2017 completion date. 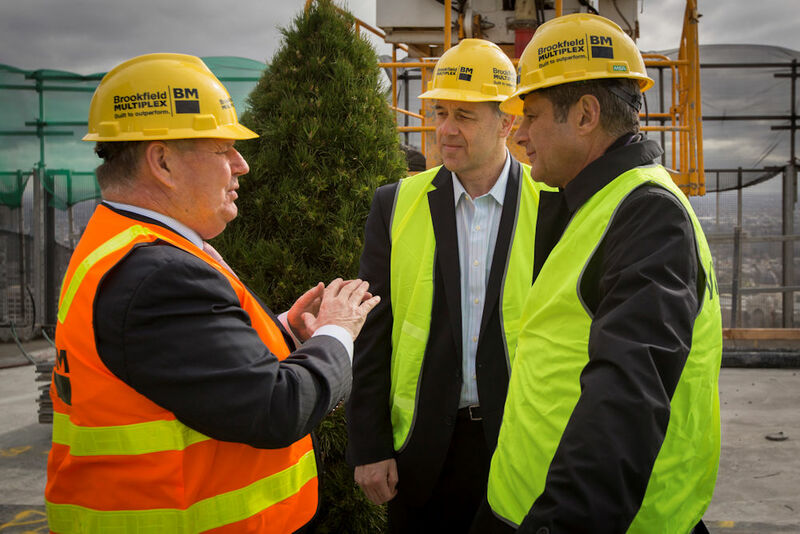 The $350 million development is the result three of Melbourne's elite development entities joining forces; developer Cbus Property, architects Bates Smart and builder Brookfield Multiplex. 35 Spring Street's prominent position led Bates Smart to create a tower with a skin based on fabric patterns, or that of ashlar patterning found in masonry walls. The result is now on display for all to see, with the facade rapidly approaching the tower's peak. Positioned by Cbus Property at the time of launch as an elite apartment tower containing 270 dwellings, the final number of dwellings shrunk considerably to 242, owing to the merging and customisation of apartments as requested by purchasers. Demolition works for the project began in 2013, with the core emerging above ground during May 2015 after extensive basement works. Thereafter Brookfield Multiplex have taken the build to its current position which culminated in last Friday's final concrete pour, which was attended by Cbus Property CEO Adrian Pozzo, Cbus Super Chairman Steve Bracks, Lord Major Robert Doyle and a host of personnel attached to the project. Common to each speech delivered was the recognition of 35 Spring Street's high level of design merit, and the prominent position it finds itself in at the eastern edge of the CBD. This is an exciting time for Cbus Property as we near the successful completion of our first premium residential project in Melbourne’s CBD, setting a new benchmark for our current inner-city, high-end developments in East Melbourne and at 447 Collins Street. 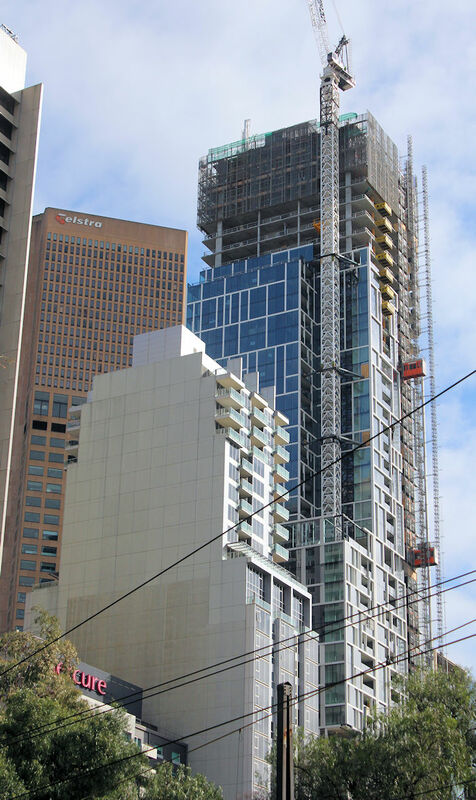 There is a limited supply of premium residences in Melbourne and the popularity of 35 Spring St has confirmed a change in the way Australians regard inner city apartment living. As touched upon by Adrian Pozzo, September shapes as a big month for the developer with their premier development at 447 Collins Street kicking off. A twelve month timetable will see demolition of the balance of the existing structure onsite, followed by site retention and excavation works. Beyond that point construction proper on Collins Arch as it will be known will begin in earnest. It along with Classic East Melbourne and 35 Spring Street form the backbone of Cbus Property's current push into the luxury apartment sector. September will also see construction on another Cbus Property project begin, with Built. installed as head contractor for Volaire. Consisting of 154 apartments, Voliare will rise directly opposite North Melbourne Station. This is an excellent development, right on the edge of the CDB with uninterrupted views over the beautiful gardens and looking east towards the hills in the distance. All we now need are more of this type of development along our CBD edge with high quality finishes and design. I for one, look forward to seeing the old Mecure hotel a few doors south of this development, disappearing for a much taller residential tower some time in the not so distant future. Agreed. I think that this is a very elegant addition to the skyline from all angles - at it seems like it must be a joy to be on the inside of it too.